Chemco Systems Mdl D-7100 "Plow Blender" Material Mixing & Blending system for uniform mixing and stabilization of products such as, bio-sludge, chemicals, industrial products, lime treatment, fertilizer, sand, compost, finished product aggregates,, etc. at up to 250tph. 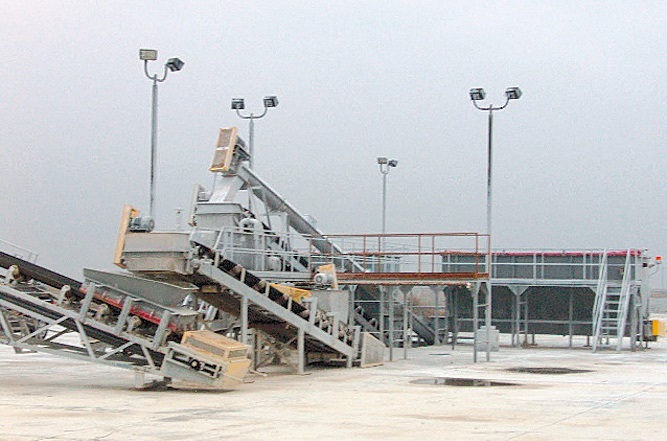 Also includes catwalk system, two 8-1/2' wide x 20' long hoppers, three 30" wide conveyors x 45' long, 17' long, and 26' long, a 12" diameter x 45' long stainless steel screw conveyor, and a Cutler-Hammer control center.